In an effort to be healthier (thanks to a slightly elevated cholesterol level), I'm eating more vegetables (less fat & carbs) these days. That is to say: I'm totally food bored after two weeks of salads. And then I tried this...a stupidly simple salad that I can't seem to get enough of. It makes a lovely side dish particularly for BBQ or sandwiches (I ate it with a BLT on whole wheat toast). It holds up well, too, so it's great for picnics. NOTE: I've tried raw Brussels sprouts salads before, one in particular was made with a lemon dressing, but they were always too bitter. This one, however, is just perfect with a hint of sweetness from cider vinegar and honey. Trim the stems off of the sprouts & removed any gnarly outer leaves. Thinly slice the sprouts. Core & quarter to the apple. Thinly slice. 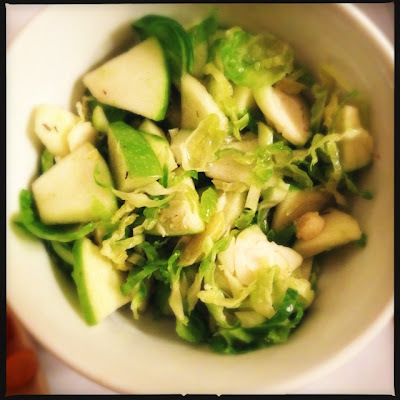 Toss the apple & sprouts in a medium bowl. In a small bowl. whisk together the dressing ingredients. Pour over the salad & toss. That sounds amazing! I have pinned it for immediate future reference. Great! Thanks! It's so simple but so tasty!